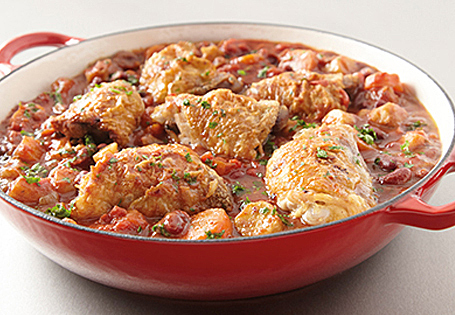 Warm up with this nutritious and flavorful one-pot meal. In a large pot, heat the vegetable oil over medium-high heat. Season the chicken thighs to taste with salt and pepper. Cook chicken about 5 minutes per side or until brown and caramelized. Remove chicken from pot and set aside. Add onion, garlic, cumin, paprika, ginger and crushed red pepper. Cook for 1-2 minutes until fragrant, stirring constantly. Add flour and cook for 1-2 minutes, stirring. Add chicken broth and diced tomatoes. Whisk to dissolve flour mixture and scrape up the brown bits from the bottom of the pan. Add potatoes, carrots, squash and beans. Season to taste with salt and pepper. Return chicken thighs to pot. Bring mixture to a boil and reduce heat to a simmer. Cover and cook for 30 minutes, or until the vegetables are tender and chicken is cooked through. Top with chopped parsley or cilantro. Dollop each serving with yogurt, if desired. Tip: This dish is even more delicious if chilled overnight and reheated. Cook it on the weekend and enjoy during the week.